This weekend senior Fitzgerald, who finished 2nd overall and 1st for W&M, and talks about his race. Click here for the podcast. William and Mary’s women’s cross country team ran very well Saturday at the Colonial Inter-Regional, coming within 12 points of upsetting 20th-ranked Georgetown. The Tribe finished third in the 10-team race, behind the Hoyas and team champion Virginia. Read more. The 13th-ranked William and Mary men’s cross country team put three runners in the top five Saturday at the Colonial Inter-Regional Challenge, but were unable to overcome No. 16 Georgetown in the team race, falling to the Hoyas 26-37. Read more. At the first meet of the year freshman Tom Burke placed 1st for W&M in 25:59 for 8K and 21st overall. In high school he was 6th at the Minnesota State XC meet and has run 4:14.80 for 1600m and 9:11.36 for 3200m. 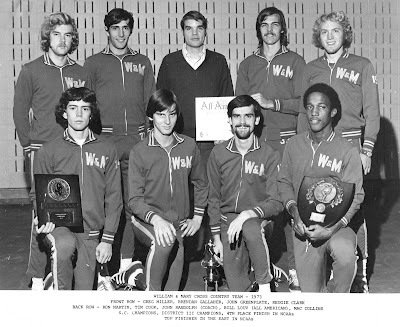 What follows is a quick interview he gave about his early experiences at W&M. Q. What kind of mileage did you do during xc in high school? And this season? A. In high school, I ran about 70 miles per week. The most I ever got up to was around 75. Usually this was with 2 or 3 doubles per week. This season my milage has consistently been around 80 miles. I haven't done any doubles. Read More. Two weeks ago Arlington native, Emily Gousen led the women’s team to a second place team finish at the Lou Onesty Invitational where she also finished second in 18:06. What follows is an interview with her. Q. How much of an improvement was your performance? A. When I ran at Panaroma Farms my freshmen year in 2004, my time was at least 2 minutes slower. I didn't break 19 minutes in a cross country 5k until ECACs 2006, at Van Cortland Park in New York. Read more. With the World Athletics Final today marking the last track meet of the year, it is appropriate to look back at W&M times for the year. Assistant Coach Ed Moran '03 was 3rd on the 2007 US list (and 56th on the world list) in the 10K with his 27:43.13 (the fastest 10K ever run by a W&M athlete) while Keith Bechtol '07 was 36th with 28:55.57. In the 5K, Moran was 8th with his 13:20.35 and Sean Graham '04 was 10th with his 13:23.50. In the 3K Graham had the 9th fastest US time with 7:47.69 and Moran was 13th with his 7:50.34. While there are still plenty of marathons to be run with the Olympic Trials just a little over a month away, Jacob Frey '04 is currently 3rd on the list with a 2:16.44. The men's 4x800 was the 13th fastest in the US in 7:24.97 while the women garnered the same number in the 4x1500 with a 18:31. Finally Bonnie Meekins '07 in winning the ECAC Heptathlon was 25th with her school record of 5457. Many of these links above contain gun to finish video coverage of the races. For the annual US men's list go here and here for the women. Senior Emily Gousen (Arlington, Va.) was honored today by the Colonial Athletic Association as Co-Runner of the Week, sharing the award with Towson’s Katie Ogden. It is the first such award in her career. Read more. 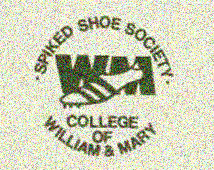 William and Mary’s men’s cross country team opened its 2007 season at the Lou Onesty Invitational, placing fourth out of nine teams. Duke won the event with a score of 35-55 over the host Cavaliers of the University of Virginia. Virginia’s Andy Biladeau ran 24:25.8 to claim a 12-second victory in the eight-kilometer race. Read more. Senior Emily Gousen (Arlington, Va.) and the William and Mary women’s cross country team picked right back up where they left off last November, powering to a second-place finish at the Lou Onesty Invitational. The host Cavaliers won the eight-team event, 30-37, behind 2006 All-American Emily Harrison’s winning time of 17:16.5 on the five-kilometer course. Read more. 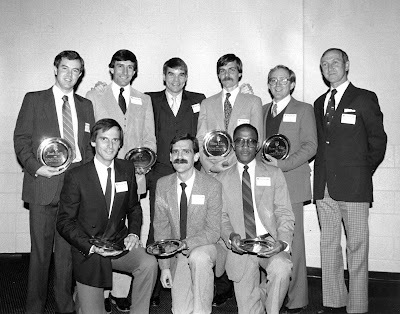 W&M's Best Ever Cross Country Team (as they looked in 1973 and when they were enshrined into the W&M Hall of Fame).